It was with great sorrow that I heard about your sudden departure from this world. Although we regularly hear about these things in sastra and are constantly preparing ourselves for such inevitable events, somehow when they actually happen we seem totally unprepared. And so it is that I can hardly believe you are no longer among us. Your departure leaves a deep sadness in my heart. It is said that time heals all wounds, but this maxim does not hold true with the departure of Vaisnavas. In fact, the wound only becomes deeper as we remember their personalities and the contributions they made to this historic movement, which is establishing the teachings of Sri Caitanya Mahaprabhu all over the world. No doubt your departure was auspicious because you have gone back to Godhead. Be that as it may, you have left us - your godbrothers, disciples, and friends - lamenting. Your return to the spiritual world is a gain for the devotees of that transcendental abode but a tragic loss for us. Not only for us, but for all the conditioned souls who might have met you, had you stayed a little longer. A devotee of your caliber is always focused on the mission of his spiritual master: to shed light on the science of Godhead for the benefit of others. When such a preacher departs, that light goes out, and the world becomes a little darker. You and I were friends. Some people say such things casually: "Oh, so and so is my friend," or "Yes, I know him. He's a friend of mine." But friendship in Krsna consciousness is not a casual thing. It is a special blessing of Krsna to be cherished as dearly as life itself. It is not based on shared material desires but is established on and matures through service to guru and Gauranga. It goes deep and is relishable because of the blissful experience of preaching Krsna consciousness together. The camaraderie that you and I shared in our preaching in England, Russia, and India was always enlivening for me. We seemed to have a natural attraction to each other, even though we were different in many ways. But it is said that opposites attract. I tend to be outgoing and social, whereas you, because of your humility, were often shy and reserved. Still, as different as we were, we shared many interests, such as kirtana, lecturing, and annual visits to Sri Vrindavana Dhama. In fact, it was your strong attraction to Vraja bhakti and your determination to achieve it by spending as much time as possible in Sri Vrindavan Dhama doing bhajana that endeared you to me. You would spend many a Kartika in the dhama studying sastra and chanting the holy names with fixed attention. Because you were well read, you had a deep understanding of the scriptures and a unique ability to communicate this to others. That was evident in the classes and seminars you gave, which were always popular with the devotees. 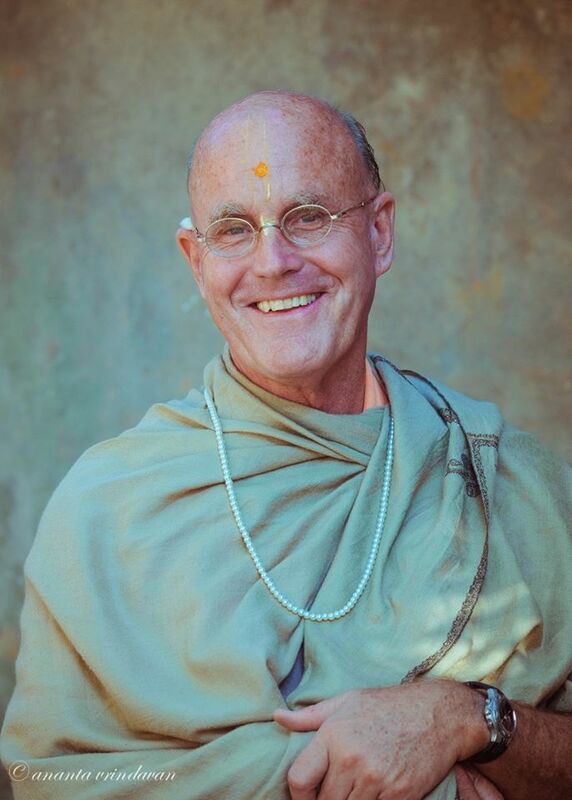 Because of your limited preaching field, you were not well known within our ISKCON movement, so I was happy when the GBC acknowledged your abilities and had you convene and chair the Sastric Advisory Committee. I'll never forget the time your sastric knowledge saved my lowly self from embarrassment. One Kartika I joined a large parikrama party going to Visrama Ghat on the border between Vrindavana and Mathura. It was headed by Radhanath Swami and attended by many other illustrious godbrothers: Deena Bandhu Prabhu, Bhakti Caitanya Maharaja, BB Govinda Maharaja, and others. Hundreds of devotees from around the world had filled the many buses that took us on the parikrama. By Krsna's arrangement I was sitting next to you. At one point we received a message from Radhanath Swami saying that all the godbrothers would be asked to speak for a few minutes. I immediately became anxious because I knew little or nothing of the pastimes that took place at Visrama Ghat. When I mentioned this to you, you smiled. "Write down what I tell you as notes," you told me, "and you can use them when you speak." You went on to describe the pastimes at Visrama Ghat in great detail with many anecdotes and realizations as revealed by Visvanath Cakravarti and others. You suggested I read the notes until we arrived at the holy place so that when I spoke about the knowledge you'd shared with me it would seem natural. Just before we arrived you quizzed me on everything to be sure I knew it all by heart. When we arrived at Visrama Ghat, some seven hundred devotees sat down at that auspicious place, with the godbrothers facing them in front. I was called on to speak first. As I took my place at the microphone I glanced over at you, and you winked, giving me assurance that everything would be all right. I began to speak, and because I had read my notes repeatedly the lilas and pastimes flowed easily from my mouth. It was a wonderful, transcendentally satisfying experience. Afterwards many devotees complimented me on my talk, even Radhanath Swami. "I had no idea," he said, "that you were such a rasika devotee with such deep realizations and understanding of sastra." In all honesty, I had no choice but to tell him the truth, that I had learned these things from you just an hour earlier. So I was saved from having to show my lack of knowledge, and I thank you once again. Though younger than me and with fewer years of devotional service in this lifetime, you were in fact more advanced than me in every way. I find it regrettable that you did not receive the recognition you deserved during your lifetime. Sometimes such acknowledgement places a devotee in a better position to share his knowledge and realizations with others, who benefit from his saintly association. There are too few like you, Maharaja, too few willing to sacrifice anything and everything for preaching the mission of Lord Caitanya Mahaprabhu. Especially after taking sannyasa, you were busy all day every day in various ways, sharing your good fortune with others. I will miss you. Your godbrothers and godsisters will miss you. Your disciples will miss you. And the people of Bosnia, Croatia, and Russia will miss you though they know it not. In reality, a great catastrophe, a great calamity, has befallen society: a capable and faithful Vaisnava who was doing the highest welfare work has departed. Hundreds of billions of ignorant souls cannot compare with one humble Vaisnava like you. The world does not know what it has lost. We know, however, so we are remembering you and keeping you close to our hearts. But I do not feel that we are alone. The service rendered by you and by other devotees like you will be recognized by the denizens of the higher planets. Why not? Surely your spiritual master, Srila Prabhupada, recognized you, and he is the sum total of all the demigods. On the day of your samadhi ceremony, I, like many others, offered you my final respects and my most humble prostrated obseisances. I would consider it my great fortune should I serve alongside you in a future lifetime.